During a camping trip, Jasmine Taylor is taken by a mysterious man, Orion, to a world she didn’t think would be possible to exist. Tamporlea is a beautiful world filled with magical Gypsies and unusual expectations of its inhabitants. However, she quickly faces betrayal within it’s walls and a war between the three Gypsy kingdoms. Jasmine must choose to either return home and forget Tamporlea‘s existence, or rule this mysterious kingdom as their Queen, but can she do everything that is expected of her? Hello Jasmine! Welcome to my blog! Thank you so much for having me! I've never done an interview before but now that Tiffany Lovering has put the story of Tamporlea out there for everyone to read, I'm getting more requests. Being Queen takes up a lot of time but when I saw your website, I couldn't say no to you. For our interview today, we’re going to do something a little different. We’re going to play a game of word association. I’m going to say a word, and you just say whatever comes into your mind. Magic: That's what has kept Tamporlea running so smoothly for centuries. It's a very useful tool, but can also cause a lot of trouble for us. There was a sense of superiority that those with magic felt for so long, it was almost forgotten how important the Commoners (those without magic) are to Tamporlea. Magic comes in all types of forms here, but I think the true magic is the fact that when times are at their worst, we can all band together for the good of Tamporlea...at least for the most part. Secret: Having a secret is a lot like lying in my opinion. Secrets have the potential to destroy relationships, families or even our entire society. Tamporlea has had to endure the effects a secret can have many times, but I think we are all learning that keeping secrets is never a good idea. Love: This is the entire reason for Tamporlea's existence and continues to be the glue that keeps us together even in the worst of times. There are many types of love within our walls. Love of family, community, environment and history. It's the most beautiful kind of magic because everyone can both give and receive love and it has the potential of changing the world...I wish more people would remember that. Mystery: It keeps life interesting, especially in Tamporlea. I can't say that I'm always happy with the effect a particular mystery has on the kingdom, but sometimes it can be fun. The people love riddling out a good mystery, and I think we all are a little frustrated (okay, A LOT frustrated) when something remains a mystery. War: I was afraid this word would come up. War between kingdoms, and even within the kingdom is a very difficult time for everyone involved. While we are highly prepared now, we weren't when I first became Queen and we lost many people. I would love to say that there are better ways to handle difficult situations, but when those better ways are met with opposition, war is sometimes necessary. Loss: I suffered the worst kind of loss when my father died and I couldn't imagine anything worse than that. Then, I came to Tamporlea and for the first couple years, we lost many people and I was devastated, I think we all were. We're such a close-knit community, every time we lose someone, it's like losing a mother, a father, a brother or a sister. It's never easy to lose someone in Tamporlea, but we honor each and every life within our walls both while living and after one's death. Responsibility: Everyone in Tamporlea is responsible for something just to keep the kingdom running. We all take our jobs very seriously and if one person decides to not do their job, it hurts the whole kingdom. We all keep that in mind and put in our fair share of the work. As Queen it's my responsibility to make sure that everything is running smoothly. There have been many times that I have made decisions that people don't understand or that they really don't like, but I know I'm doing the right thing for the people of Tamporlea. With that being said, I also have to be sure that the people are happy, and make changes when necessary. Royalty: The Queen has always been the most important role in Tamporlea, but it comes with a lot of responsibility. Every Queen that Tamporlea has had, has left their mark on the kingdom. Some marks are better than others, but there's a lasting impression. While I'm sure many would disagree with me, I don't see my position as Queen as being more important than any of the other tiers within the kingdom. I couldn't do my job at all without the support of everyone I oversee. Happiness: Is so often taken for granted, not just in the kingdom, but in the real world as well. It's so important that everyone cherishes the times they are truly happy because things can change in an instant. Thank you so much for inviting me to your blog. It’s been a lot of fun and I hope everyone has learned just a little more about my beautiful kingdom of Tamporlea. Tiffany Lovering is a life-long upstate New York resident and spends most of her time devoted to her daughter, Allison’s activities. In between going to soccer practice, recitals, and spending way too much time on Facebook, she writes young adult fantasies and paranormal romance. Tiffany has published many poems for small publications but Tamporlea is her first published novel. Tamporlea is the first book in the Tamporlea Trilogy which is to be followed by Unjust and Reunification. She was first inspired to write Tamporlea in January 2011 while going through photographs she had taken of landscapes around New England. One photo of a small mountain triggered her imagination and Tamporlea was born. 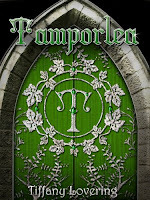 Although Tamporlea is the shortest book of the trilogy, it holds much of the history of Tamporlea as well as an introduction into the Gypsy lifestyle. Tiffany has been writing short stories since the third grade and started writing full-length novels by the time she was sixteen. Keeping those works to herself, she never thought of the possibility of self-publishing. It was her daughter who inspired her to put Tamporlea out for the world to see. Now, at 29, Tiffany plans to publish the rest of her Tamporlea Trilogy as well as some of her favorite works from the past and new adventures that come along everyday. As a character, Jasmine is very mature and knows what her responsibilities are. She seems to have a deep love for life and seems to be someone who'd do anything to help her people when they're in need. She seem's to be mature and and knows how far she will go to protect her people if they need her. Seems like a great character. I've been read this review, just for the characters indulge. When Jasmine's father died it seems she is mature can understand the situation and couldn't imagine anything it was a embrace movement in her life!